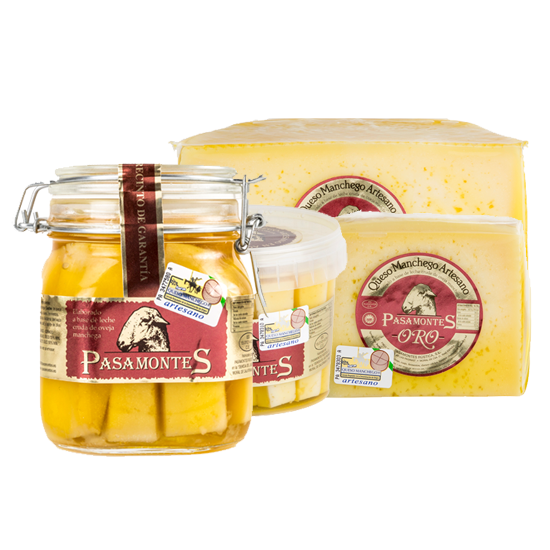 Since 1896, when Pasamontes family started to manufacture Manchego cheeses, it have been made following the artisan tradition, from milking to packaging and labelling. In addition to the characteristic elaboration process that the Pasamontes family has maintained since its origins and that we continue to maintain today, our cheeses are characterized by their unique aroma, flavor and texture that make them unique. and piquant taste of the best cheeses. Is mild taste but full in the palate, ripened in caves 3 – 4 months, is the best cheese for people who love not tender and not strong taste, the cheese to eat daily. This cheese is made with raw Manchega sheep milk, is ripened dipped in olive oil who help to gain plenty and exquisite taste. La Mancha is the largest natural region in Spain. It covers an area of 35,000 km2. It is a plain with extreme temperatures and scarce rainfall. It is also an arid territory, with little trees and a great variety of herbaceous species. The etymology of the term “stain” comes from an Arabic word that means without water. Since ancient times this region has always been populated. Its inhabitants were engaged in grazing and making Manchego cheeses. This fact is evidenced by the archaeological remains found in several sites in the region dating from 1700 years before Christ. They are remains of perforated earthenware vessels, cencelas, in which the cheese was made, and next to them bone remains of sheep. There is not only archaeological evidence of the production of cheese in this natural region, there are also bibliographical references that testify to this. Apicius Claudius, in the first century B. C., mentions in his works the “ibera cheeses”, possibly from La Mancha, as much appreciated in Roman tables. Finally, not to mention Cervantes, who in his Quixote mentions this cheese several times. There is no doubt about the existence of native sheep in this territory, which were domesticated by the first settlers. The Manchega sheep comes from the trunk between the two, its evolution has made it stand out morphologically in a very remarkable way from its ancestors. Unlike other sheep breeds, the Manchegan sheep have had a sedentary life that has allowed them to adapt and take advantage of the agricultural products and remains of the area, permanently linked to their territory. The agroclimatic characteristics and topology of this territory have sculpted the morphology of the La Mancha sheep. It is a very rustic animal which has allowed it to adapt to grazing in the arid areas of the land where it develops. Originally this breed was triple aptitude: wool, meat and milk. Over time and especially with the changes in consumption habits have caused the sheep from La Mancha has specialized in milk production to the detriment of the other two products. The increase in demand for cheese that has been produced since the 1970s has led farmers to introduce improvements in genetics and management to increase milk production on their farms. Since the beginning of the 80’s, the Manchego Sheep Cattle Breeding Association AGRAMA has been responsible for the genetic improvement of this breed. The Manchego cheese is the most imitated of Spanish cheeses and is one of the most plagiarized within the European Union. It’s really amazing but more than 90% of consumers do not know how to distinguish a Manchego cheese from one that is not. To differentiate Manchego Cheese from imitations it is necessary to pay attention to its commercial label and its identifying elements. The words’ Queso Manchego’ must appear on the commercial label and, where it is made from raw milk, the words’ Artesano’ must be added. A back label with a serial number must be affixed on top of the commercial label. All Manchego cheeses must bear on the opposite side of the commercial label a casein plate embedded in the dough also numbered and serialized. The foundation Consejo Regulador Denominación de Origen Queso Manchego is responsible for certifying the conformity of Manchego cheese with its specifications. The geographical area covered by the Protected Designation of Origin occupies 44,000 km2 within the Autonomous Community of Castilla La Mancha. In the PDO are associated 750 sheep farms in La Mancha with a census of 540,000 animals and 63 dairies that in 2016 have produced 14,000 tons of Manchego cheese. 60% of this production is exported and the main importer is the USA with 2000 tons. © 2018 Pasamontes Rustica S.L.